On Monday, we celebrate America’s 240th birthday. Independence Day is always a fun day, filled with BBQs and seeing family and friends. I love having a tasty BBQ with my extended family and then going to a local beach where we all enjoy a spectacular fireworks display. What will you be doing this holiday weekend? According to the National Retail Federation, an estimated 214 million people plan on celebrating the holiday. Consumers will spend an average of $71.34 per household on food for barbecues and picnics, which is about the same as last year. Total spending on food for this year’s holiday is expected to reach $6.8 billion. The Fourth of July holiday is also a time when many people will hit the road. If you will be traveling and unable to record your purchases and transmit, please let us know! Contact the Panel Support Center by phone (1-800-962-6700) or email them at lmorrison@ncppanel.com. Please be sure to include your nine-digit panelist ID number in the email or have it handy when you call. You should always let us know if you can’t scan due to vacation, illness, or any other personal reason so you don’t lose out on earning gift points and sweepstakes entries. If you’re an NCPMobile App user, you can continue to scan while away on vacation. I also want to reminder you that as we enter the prime grilling season, please make sure you scan all of your BBQ-related purchases! These include such items as charcoal, lighter fluid, condiments, paper products, grilling utensils, and even insect repellent and sunscreen! Well, school’s out for summer! I don’t know about you, but I’ve been hearing the Alice Cooper song everywhere. This song always signifies summer to me. Anyway, if you have young children, what interesting activities can you do with them over the summer? Here are some cool options, according to thecentsiblelife.com. Make a treasure hunt: Make a list of things they need to find wherever you are heading. The grocery store can be drawings of their favorite foods, while the park can be things like a bird, a rock, a sandbox, etc. Take out the hose and wash the car, or just play in the sprinklers. Volunteer at local animal shelter, visit a retirement community, or make some artwork for sick kids or the troops. As you can see, there’s always plenty to do. And before you know it, it’ll be back to school time! I hope you and your kids enjoy the summer. Here’s To Dear Old Dad! My dad lives in Florida so it’s not always easy to see him, but I will be sure to FaceTime him on Sunday (my dad is up-to-date on all the latest technology!). Since I’m not able to take him to a ballgame – always his favorite Father’s Day gift – I made sure to send him something special (we included some things the kids made for him). Have you purchased anything yet for the fathers in your life? According to the National Retail Federation, consumers are expected to spend an average $125.92 for the holiday, compared with $115.57 in 2015. Total spending is expected to reach $14.3 billion, but this is still well below the estimated spending for Mother’s Day, which was $21.4 billion. More than half of those celebrating the day plan to buy for their father or stepfather (53%), while others will shop for their husband (28%) or son (9%). Make sure to wish all the dads in your life a happy Father’s Day! Work more veggies into your diet. The next time you’re making fish, meat, or chicken, sauté some peppers, onion, garlic, and tomatoes to serve as the topping. You’ll be eating a more flavorful, healthy meal! Avoid overdoing it at summer BBQs. Make sure to eat the healthy stuff first. Fill up on fruits, vegetables, and green salads. Then once you’ve eaten, move! You’ll burn calories when you play with the kids or get everyone together for a game of volleyball, Frisbee, basketball, or tag. Cook at home. There are a lot of benefits to eating at home. Not only will you save money, but you’ll know exactly what goes into your meal. Plus, cooking at home is generally healthier. Don’t forget the fruit! Summer is the perfect time for fresh fruit. So add fresh berries to your morning cereal or oatmeal. Eat watermelon or cherries for dessert instead of cookies or ice cream. Get the most out of your salad. Not all salads are healthy, especially at a restaurant. Salads loaded with dressing, cheese, and fried chicken are also loaded with calories and fat. But healthy salads don’t have to be boring. Pick the ones with a lot of different vegetables for more disease-fighting nutrients. Top it off with a lean protein like grilled chicken, fish, or beans. Speaking of eating healthier, according to a recent Nielsen survey, 66% of U.S. respondents said they’re eating healthier now than they were two years ago, and 64% are trying to buy healthier foods. A total of 63%, however, say eating right is a challenge, according to Nielsen. For many consumers, particularly those with “on-the-go” lifestyles, prepackaged salads are a great solution in that they’re a healthy food choice that’s convenient and fast. While grocers continue to see some sales gains – 1% compared with the previous 52 weeks – from the sale of bulk lettuce, packaged salad kits accounted for $3.7 billion in sales in the 52 weeks ended April 2, 2016, an increase of 8% from the previous year. 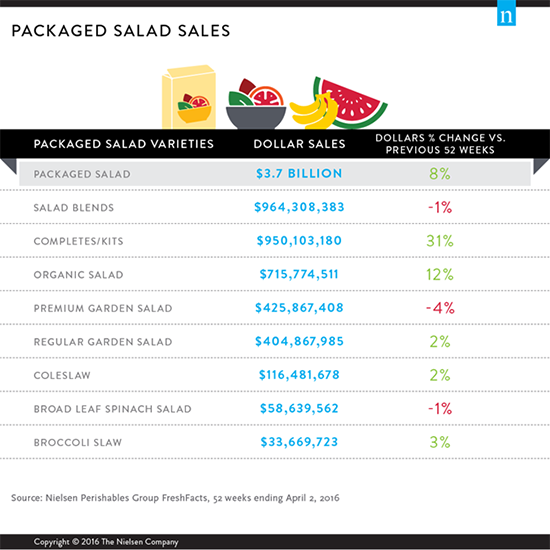 Within the product category, complete salad kits are growing the most, generating $950 million in sales in the last year, up a whopping 31% from the previous year. Prepackaged organic salads are growing faster than the average, with a 12% increase in dollar sales over the previous year, according to Nielsen. So this summer, enjoy yourself – but have a nice, healthy salad every so often! Well, it’s now “officially” BBQ season! Our family had our first BBQ on Memorial Day, and it was fantastic! If you also had or attended a BBQ this past weekend, I hope you enjoyed some tasty treats. Unless you’re a vegan or vegetarian, meat is surely going to be on your BBQ menu. During the summer months, sales of certain BBQ-able (yes, I think I just made the word up!) meats go up. In fact, beef, franks and dinner sausage marked above-average sales from Memorial Day through the week of the Fourth of July in 2015, according to the Nielsen Company. 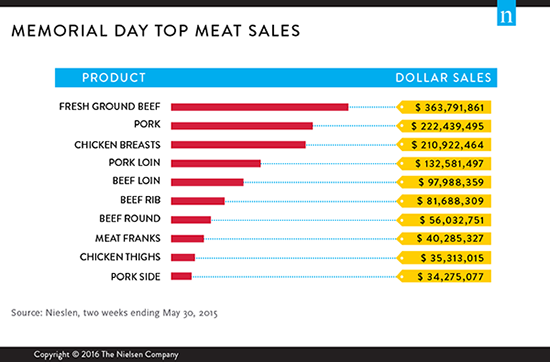 Still while hot dogs are an easy go-to choice for grilling, ground beef, pork and chicken were the most popular by total dollars sold for Memorial Day 2015. While meat isn’t always thought of as being especially healthy, it is typically loaded with protein. Protein claims on packaging are driving sales growth in a number of different product categories. For example, while overall frozen entrée sales declined, sales of frozen entree items that list “protein” as a claim on the package actually grew by 20% in 2015, according to Nielsen. When you go shopping for meat, you’ll be sure to see more items promoting protein, since many consumers may not be aware of just how much protein is in some meat. For example, in a recent NCP survey less than 40% of consumers realized that pork and chicken each contain more than 20 grams of protein for just three ounces of meat. Now for those of you who are not into eating meat, don’t forget you can also grill vegetables and even certain fruits. So whether you BBQ meat and/or vegetables and fruits, make sure to light up your grill and get cooking!